Winter’s cold weather usually causes an increase in coffee sales for your coffee vending machine. Small or large, your coffee vending machine will see extra usage from customers wanting coffee or other hot beverages to help drive away the cold. With winter coming, now is a good time to get your coffee machine in top shape for the extra stress and wear that come with that extra usage. Thoroughly clean all parts of the machine. While a clean coffee machine is always important, extra attention should be paid to any areas of the machine that don’t get as cleaned as often. A clean vending machine will work more reliably, keeping your customers happy and making more money for you. Disassemble and clean all available parts of the machine, including the water supply line (water supply lines can become clogged with hard water deposits that can slowly reduce the supply of water to your machine.) Replace any needed water filters. Test the operation of your machine. Test all vending options, including each of the hot beverage selections. Make sure the coffee, cappuccino, hot chocolate, and other hot beverages produce an appropriate amount of product to fill the cup, and that the beverages taste and smell good. Also test the bill acceptor and coin mechanisms for proper operation. Refill any supplies. Update labels, signs, and any lighting. Labels and signs can eventually peel or fade, making your machine look dated and old. The lights in your coffee machine can also become dimmer or begin flickering if the bulbs are too old. To draw more attention to your coffee machine and make the machine more appealing to customers, replace any needed labels or bulbs. Consider adding a small supply stand near your coffee machine. A small supply of napkins, coffee stir sticks/swizzle sticks, and even sweetener next to your coffee machine can sometimes increase your sales. 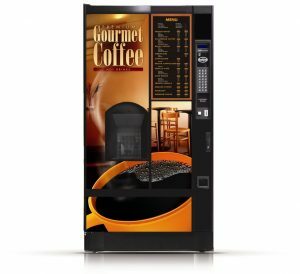 If you are unable to repair your vending machine on your own, Maximum Vending of Albuquerque, NM can replace any needed parts or provide more in-depth service for your coffee machine. Call us at (505) 980-6764 to tell us how we can be of service to you.